Michael Peterson first took up the harpsichord at the age of sixteen when he decided that he would rather have one instead of a car. Since then, he has become an active musician based in the San Francisco Bay Area. Although his repertoire spans hundreds of years, Michael specializes in music from the high Baroque, including the works of Johann Sebastian Bach and Georg Frideric Handel. 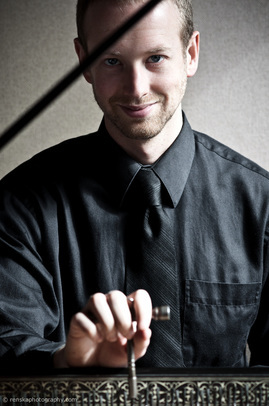 Highlights from recent seasons include performances as concerto soloist with the Pacific Chamber Orchestra and the Monterey Symphony Chamber Strings. Michael is also heard regularly with the Laudami Ensemble, of which he is a founding member, and as a staff accompanist at summer early music workshops. Some of his other projects include performances with American Bach Soloists, the California Bach Society, Soli Deo Gloria and the Jubilate Baroque Orchestra. Michael graduated with honors in harpsichord performance from Stanford University, where his teacher was Elaine Thornburgh. He has also recently received diplomas at the Royal Conservatory of The Hague, where he studied harpsichord with Jacques Ogg and basso continuo with Patrick Ayrton.